Wet conditions on day one and a strong wind on day two failed to dampen spirits at the England Athletics under-23 and under-20 Championships in Bedford, with many athletes securing automatic selection for their respective European age group events in Tallinn and Eskilstuna in July. 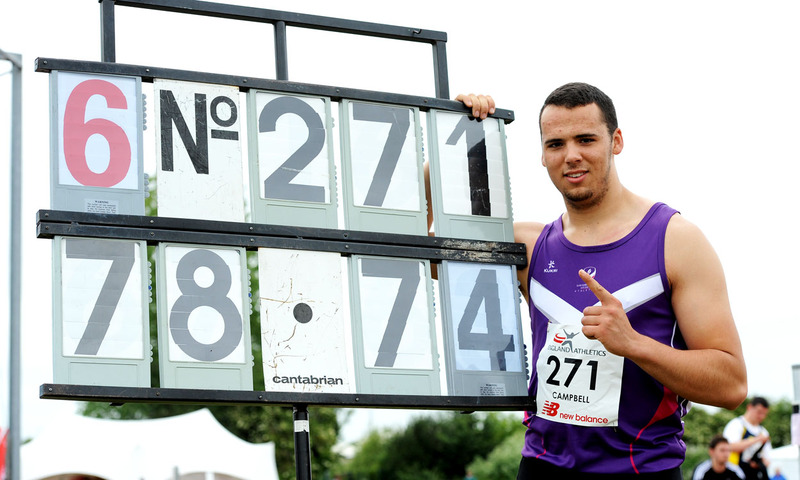 There was no disputing the performance of the weekend, which came from Taylor Campbell in the under-20 hammer, as he set his fifth UK junior record of the year with 78.74m to go to third on the European junior rankings. However, as always, Britain’s finest young athletes put on a good show, with many exciting battles and high-quality performances. Ojie Edoburun was an impressive 100m victor in 10.33, thus securing his place on the plane to Sweden. Having been disqualified in this event last year and claimed bronze two years ago, the championships had been a major target for the 18-year-old, but now he hopes to emulate the success of his training partner Chijindu Ujah, who won the European junior 100m crown two years ago. “It would mean a lot to me and my coach (Jonas Tawiah-Dodoo) to bring the title back to our training group. Hopefully I can run faster and push for a place in the senior team later in the summer too,” said the ambitious youngster. In the under-20 distance events, Kyle Langford, Josh Kerr and Alex George each earned automatic selection after winning the 800m, 1500m and 5000m events respectively. Fresh from her 2:03.32 PB, Molly Long also ensured European junior selection after winning the 800m. World junior heptathlon and high jump champion Morgan Lake was a class apart in the long jump and high jump, recording 6.18m and 1.94m respectively for a double victory, while Adele Nicoll won her eleventh England age group shot title with 15.23m, well over the standard required for Eskilstuna. In the sprints, Daryll Neita took the 100m in 11.44, Shannon Hylton the 200m in a wind-assisted 23.22 and her sister Chereice the 400m in 53.54; all three winners having the qualifying mark. Distance runners were the pick of the under-23 men, with Jonny Davies taking a slow run 5000m, 1500m specialist Charlie Grice honing his speed with an 800m victory and Neil Gourley taking the 1500m by six seconds from Cameron Boyek. All of these athletes are already in possession of the qualifying mark for Tallinn. The 2.26m high jumper Chris Kandu retained his title, but was far from pleased with his winning height of 2.16m. “My body wasn’t 100% after the hard week of training I put in, as I’m getting ready for the British Championships next weekend and the European under-23s the following week, which are my main priorities. My first aim is to get there healthy but its time I came home with an international accolade to my name,” explained Kandu. Melissa Courtney set a CBP in the under-23 1500m with a 4:15.93 clocking, but still needs to obtain the qualifying standard of 4:13.0. Having run the time last year, the Welsh international is still hopeful. “I’m racing at the BMC Grand Prix in Watford next weekend and it looks a good field,” she explained. Katie Snowden won a high quality 800m in 2:04.68 to book her place in the team for Tallinn, while Yasmin Miller beat European indoor pentathlon champion Katarina Johnson-Thompson in the 100m hurdles, 13.34 to 13.44.